I'm not overly familiar with rockumentaries, but this one is hardly a true rockumentary. While it does, for a while, follow The National while they're on tour, it never really becomes about the band. 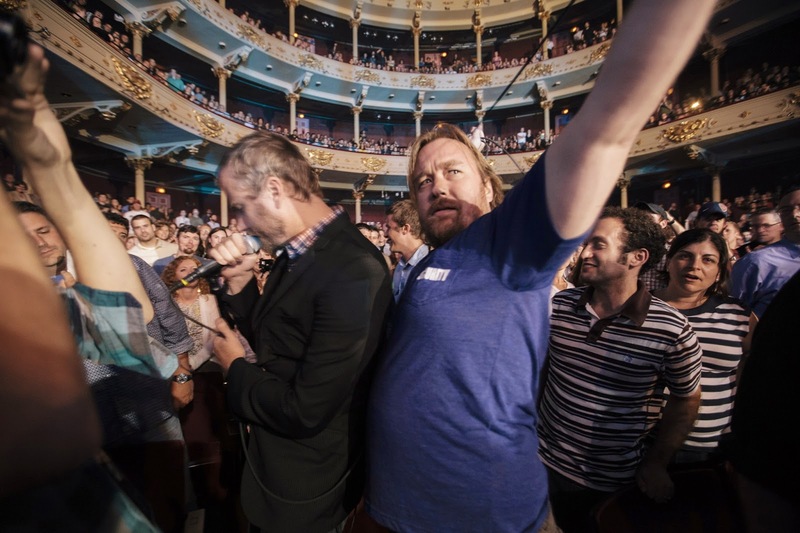 Tom Berninger follows his brother, Matt, the lead singer of the band The National, while they are on tour. He constantly tries to keep up with the band members, and they continually tell him to stop. It's only natural, as the band is busy setting up for shows and working out the kinks, the last thing they need is someone sticking a camera in their face attempting to get some sort of useful response out of them. The band expects him, since he's there following them, to participate in their tour and help out when they need things done. However, Tom's first priority is always his film, he's constantly letting them down and messing things up. He isn't accustomed to life on the road, or the roller coaster of emotions the band goes through while on tour. Not having made a film before though, he's unsure of what he's doing. He doesn't particularly have a plan as to what the film should look like, or what the film will say, he's hoping to find it along the way. All of this is frustration, not just for Tom, but for Matt and the rest of the band, who expect him to make something good, that doesn't put them in too bad a light if he's going to produce anything at all. At some point you realize that it isn't really about the band, it's about Tom and his relationship to his brother Matt. Tom is the less accomplished of the two, he's struggling in life as he attempts to emerge from his brother's shadow. Matt, although capable of losing his temper at times, is maybe the most patient in dealing with his brother, and always tries to encourage him to make his film. As with any family, there are fights, and misunderstandings, but they are siblings after all so they will never not be friends, or I suppose family makes them more than friends. These types of squabbles might separate friends, but are never really enough to sever the ties between family members. It's nice to see that Matt, despite his success, never loses sight of his family. It's a poorly shot, poorly made documentary, obviously the workings of a non professional. At times it feels like it's meandering and lacking any sort of direction, yet by the end, by some miracle things come together in the form of a moving story of two brothers. The story even has the ups and downs, and character growth of a typical film. Perhaps inadvertently, Tom ends up the subject of his own documentary. I say that not to make him sound egotistical, because you can tell by the way it's shot and what takes place that it's by pure happenstance. Also, Matt's wife, Carin Besser, is listed as an editor, who likely had a vast amount of input on the overall shape of the film. In some ways it reminded me of Sarah Polly's 2013 documentary Stories We Tell , in which Sarah listens to the stories each of her family members have to tell and sees the differences and interpretations of the family's many memories, and explores the difference between the truth and those memories. That film became more about Sarah's search for her real father, and how our experiences growing up, those we grow up with, and our memories shape us as adults. 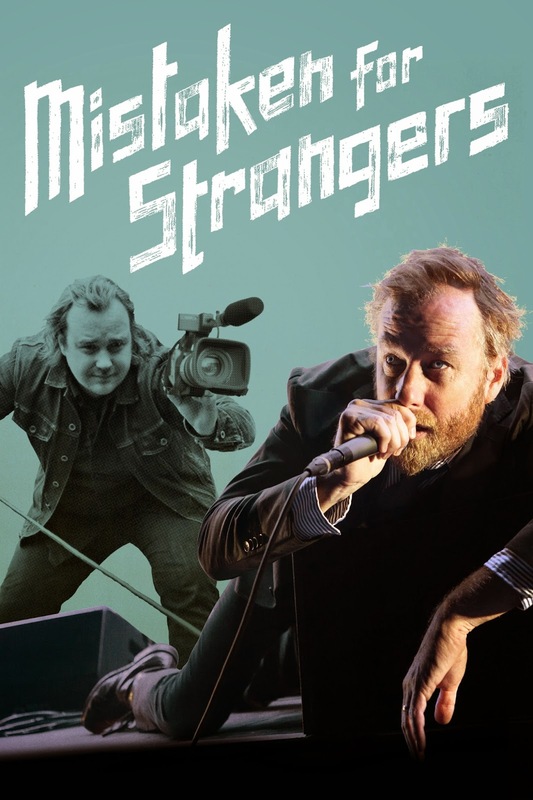 Mistaken For Strangers is Tom's search for himself, his search for belonging, and coming to terms with the fact that his brother is famous and he is not. Fans of The National need not worry about the band, they come out of this film no worse for wear. Their music provides a moving accompaniment to the story unfolding before we know it. It's short at only an hour and fifteen minutes, and it's one of the most popular documentaries of the year. The title of film is taken from a song of the same name off the band's album Boxer . If you are a fan or have any interest in The National whatsoever, or even if you just like a good family drama, this film is worth seeing.